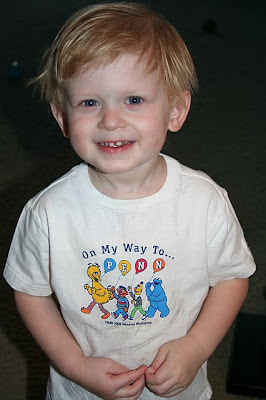 Check out Sam's cute self-fulfilling prophecy t-shirt. 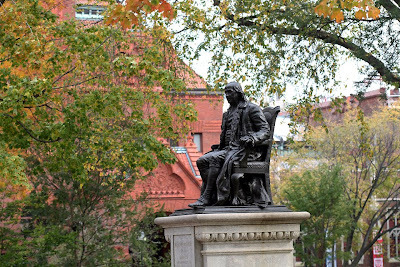 Ben Franklin is one of my favorite people from American history. 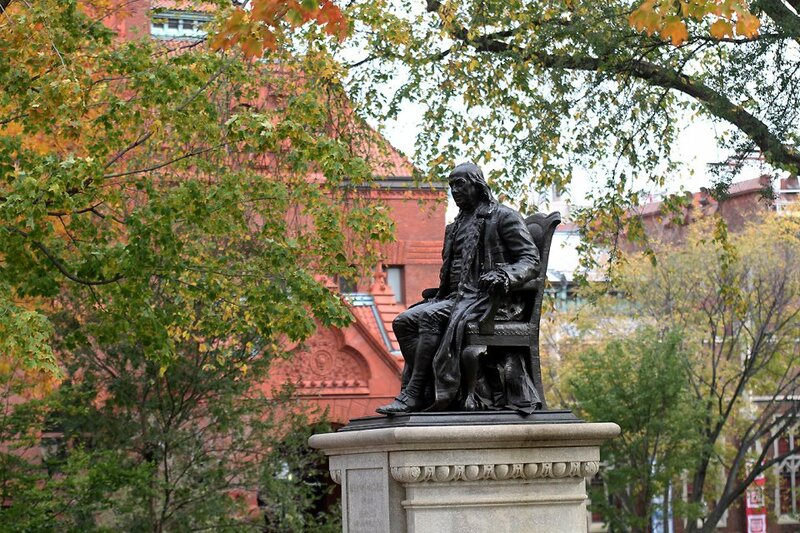 He is the founder of Penn. 2. One of my favorite books when I was a child was Where the Wild Things Are. I remember reading it one evening in my bedroom when I was around seven. I loved the story and I read it over and over and over again that night. That memory stands out clearly in my mind and that experience may very well be one of the things that initiated my love of reading books. It was so fun and intense to be transported into a different world. 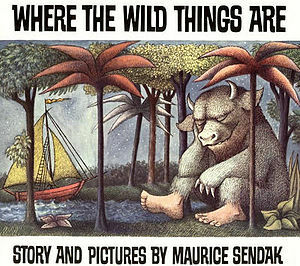 Maurice Sendak was a talented writer and illustrator, and I was sad to hear of his passing this week. I'm glad that I can read this book with my own sons now and pass on the joy of reading good stories to them. 3. I have a funny little story to tell you that happened this week. It's about a shirt. Last Saturday I went shopping and I bought a tunic-style top from Old Navy. I like form-fitting tops so this was a bit different for me, but I liked the print and the shirt looked really comfortable, plus it was one of their "Limited Edition" tops so I felt like it was special and fashionable. On Tuesday I wore the shirt and it was very comfortable, although it was too loose for my taste--I felt like I was wearing a maternity shirt--but I thought it was cute and that I looked pretty stylish, until I picked John up from the bus stop after school and the first thing he said when he got in the car was "Are you wearing your pajamas?!" I had to admit that I could see where he was coming from. Then that evening at a Relief Society activity I was holding my friend Jamie's cute 3-month-old baby, and he was fascinated by the pattern on the shirt. He couldn't stop staring at it! It was really funny. Now I know that I'll have to wear this shirt a lot whenever I have my next baby. It will be perfect since it already looks like maternity clothes anyway! 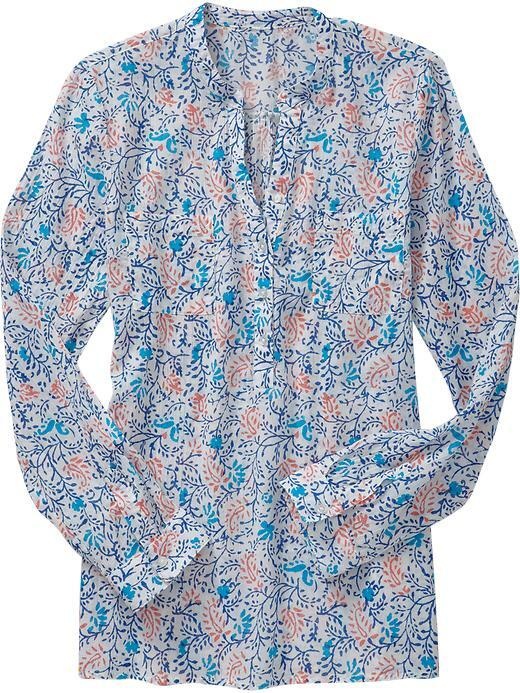 In a way this shirt is great--it's in style (supposedly), it has pajama-type comfort, and it takes care of baby-entertaining all in one. 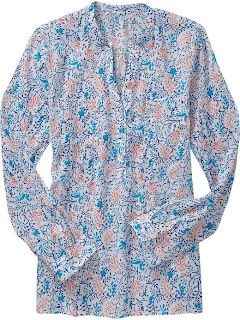 What do you think of the shirt? Be honest! 4. A few weeks ago I banned myself from going on Pinterest until I got my life in order. By getting my life in order I mean getting and staying organized, getting my various lists edited, organized, and whittled down, and figuring out a way to simplify and stay organized. I'm a very organized person by nature but I'm also a detail-oriented perfectionist and this prevents me from doing some things in a way that probably comes easily to many other people. So I thought that by not allowing myself to go on Pinterest, it would force me to get my act together and get this done. I was wrong. I'm still not organized the way I want to be. My lists and notebooks are still sitting in a sad little pile on the counter, taunting me whenever I see them. And I miss Pinterest! (I still pin things that I find online, but that's it. It's not nearly as fun.) I hope that this weekend I'll finally get my act together and then I can return to the fantastic land of pinning and fantasy. I miss pinning things like this! 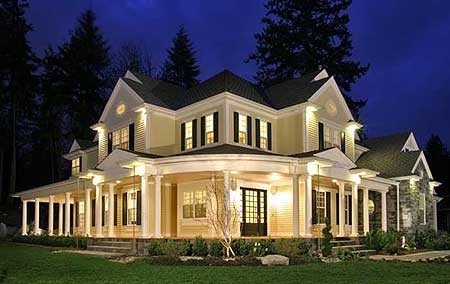 Check out that wrap-around porch! I love this house! 5. Speaking of this weekend, as you may know it's Mother's Day weekend. I decided that all I really wanted for Mother's Day was a night to myself and a morning to sleep in, so tonight I'm staying at a hotel--All. By. Myself! Needless to say, I'm really looking forward to it. Peter and the kids and I are going to eat an early dinner, then we'll go to the hotel and swim in the pool (I guess I can share that with them), and then they'll go home and I'll stay behind to read, relax, and sleep in in the morning (I'll be surprised if I make it past 8:00 a.m., but that's still better than my usual 6:30 wake-up time!). Then I'm going to get a 90-minute Swedish massage. Sounds pretty perfect to me!